A whole food, all-natural dietary supplement containing a blend of six ultra-potent mushrooms promotes detoxification, reduces inflammation, boosts energy and offers nutritional support for cellular health of skin, hair, scalp, nails, and lashes. How it works: Ultra-potent, all-natural supplement offers nutritional support for cellular health for stronger skin, hair, scalp, nails, and lashes. Rich in the antioxidant Ergothioneine, Vitamin D and other bionutrients, this formula replenishes the body's essential building blocks and supports a healthy immune system. 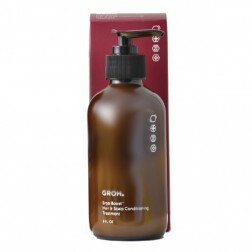 Hair Results: Smooths and increases shine. Strengthens and stimulates growth. Nail Results: Strengthens and fortifies nails, stimulates growth. Skin Results: Inhibits the oxidation process and limits the spread of free radicals for more radiant, resilient, younger looking skin. Diminishes the appearance of fine lines and wrinkles and gives skin radiance and glow. Well-being Results: Reduces inflammation, strengthens immune system, boosts energy. Key Ingredients: Mushrooms: Organic ErgoD2,® Pleurotus eryngii (King oyster), Hypsizygus mamoreus (white beech), Cordyceps militaris, Grifola frondosa (maitake), Trametes versicolor (turkey tail), Ganoderma lucidum (reishi). Other Ingredients: Vegetable capsules, organic myceliated whole oats. How To Use: Take two capsules daily in the AM, with or without food. 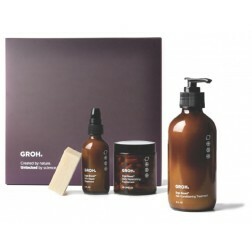 For best results, use with other GROH topical hair and skin products. 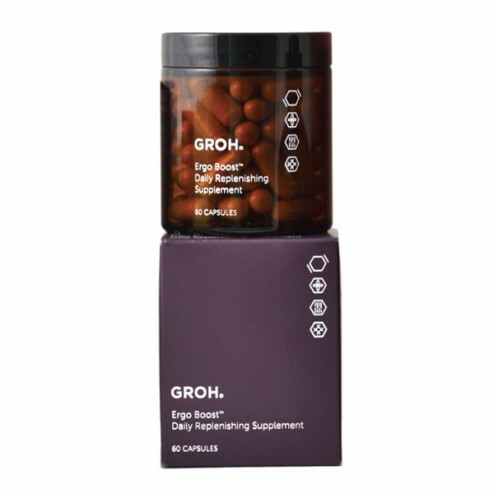 Key Ingredients: Mushrooms: Organic ErgoD2,® Pleurotus eryngii (King oyster), Hypsizygus mamoreus (white beech), Cordyceps militaris, Grifola frondosa (maitake), Trametes versicolor (turkey tail), Ganoderma lucidum (reishi). Other Ingredients: Vegetable capsules, organic myceliated whole oats.